Although centrally located, this beach sees very few visitors. Found between Cockburn Town Beach and Governor’s Beach, this section of coastline is typically a bit quieter than the other popular Grand Turk Beaches while still being easily accessible. There are rocky spots, but the beach here is quite nice. Casuarina trees line parts of English Point Beach. English Point Beach is a .8 mile (1.3km) beach on the west side of Grand Turk. A bit rockier than the adjacent Governor's Beach and Cockburn Town Beach, this coast is however sheltered and generally secluded. Casuarina trees line the shore in places and offer shade. Several vacation rental villas are found at the northern end of this beach. 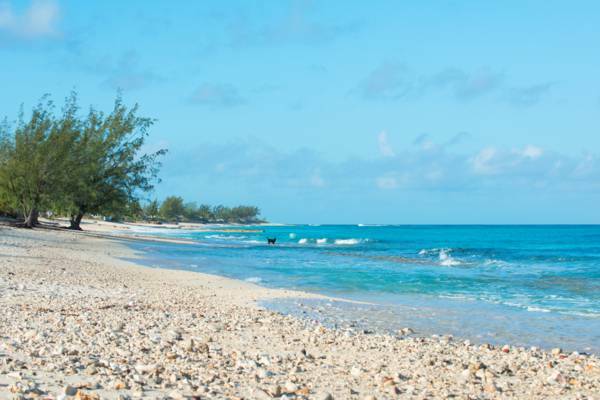 The best access for English Point Beach is found near the western end of the runway of the Grand Turk JAGS McCartney International Airport (GDT). A small Columbus Landfall National Park sign marks the spot. Just outside the capital settlement of Cockburn Town, English Point is within short driving distance of town, the airport, and the Grand Turk Cruise Center. Due to a slight projection of low rocky ground at the point, shells, small pieces of coral and coarse sand collect. English Point is part of the Columbus Landfall National Park, which includes almost the entirety of the west coast of Grand Turk. There’s very little decent snorkelling here. A rock shelf is found off the beach in many areas, but is largely devoid of live coral. The northern end of this beach has the best reef in the area, but much of it is farther than 200 feet (64 meters) off the beach. English Point Beach isn’t located far from the Grand Turk Cruise Center. However, due to the typically intense Turks and Caicos sun and the lack of sidewalks, it isn’t really feasible to walk the distance. If you don’t have a rental vehicle (we generally recommend that visitors rent a car or golf cart for their stay), it’s possible to take a taxi. Rates should be $4 per person each way. This point is the main access for English Point Beach. There’s plenty of space nearby for parking.